Blog - Page 2 of 3 - Internet Marketing that Works! There’s a WordPress plugin called WP Download Monitor that is very useful for small business owners! One of the biggest challenges for small business owners is making sure they get value for the money they spend marketing online. This means that everything needs to be tracked. Having Google Analytics installed is of course the first step. But if you’ve messed with Google Local Business Center (LBC) you know that Analytics and LBC don’t play too well together! This subject came up for me recently when I was asking some questions about Google Boost. For those who don’t know, Boost is a sort of “Adwords for Dummies” program. No insults intended here, I was a tad in the dark about Boost until just a couple of days ago, but that’s the subject for another post – coming soon I promise! This post is about the plugin remember? It’s called WP Download Monitor. This free plugin solves a very important problem for the small business marketer. Here’s what it does. After some fairly simple set up, it will track and record how many times a pdf is downloaded from your site. You can have as many downloads entered into it as you need. Why is this useful? Of course it also allows a lot of other great stuff like testing different versions of the coupons, and measuring different traffic channels with different sales copy. Over the next week or so I will try to get a short video up showing new users how to set this up, and I’ll talk more about Google Boost and why you should be using it with or without Adwords. Hint – part of the reason is because Google has a nice promo going on and they will give you $100 worth of impressions if you spend $50. I’ll take that offer any day of the week. Is Adwords worth it for my business? There a lot of people who will tell you that Google Adwords doesn’t work, that it’s just a scam for Google to rake in cash! 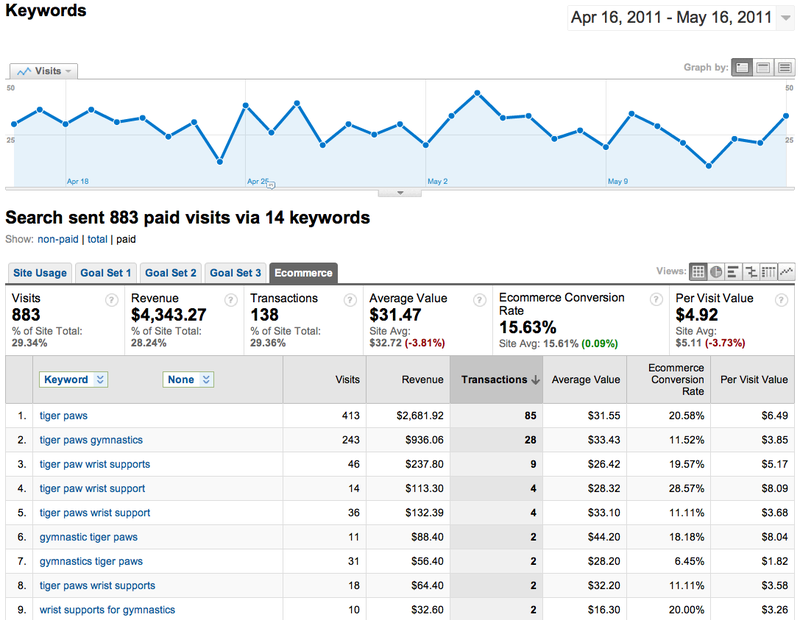 If you’re a business owner who doesn’t use Google Adwords, you should look at this carefully! First know that I pay an average of $0.22 per click or visit. That means that for this period, 30 days, I spent 883 x $0.22 or $194.26 for traffic. Now look at the revenue generated – $4343.27. Now look at the conversion rates for some of my search phrases, several are around 20%. One in every five persons that clicks my ad after searching on that phrase buys! I have two phrases with a per visit value over $8.00, it costs me $0.22 cents to get them to my site! Why is Marketing My Small Business on the Internet So Complicated? Local search, social media, content creation… how are you supposed to learn and do all of these things and still run a business? Like anything worthwhile, you have to just chip away at it, one step at a time. That’s one of the concepts of marketing on the internet that is frustrating to small business operators. In the good old days you just bought as much Yellow Pages space as you could afford, maybe run some newspaper ads, and life was good. Google Adwords introduces new instant preview for your ads! I just wanted to take a couple minutes and tell you about a cool new feature in Google Adwords. The graphic you see on the right section of this screen shot pops out when the searcher clicks on that little magnifying glass at the end of the first line of my ad. This feature has been available on organic search results for a short time now, but the Adwords option is very new. In addition to giving the searcher a preview of the landing page for the ad, it shows a short text snippet as well. It’s up to Google what text it thinks is most relevant but some experimentation cold be done to optimize this. There are a couple of things to note here. First is that gray box on my home page. For some reason Google doesn’t capture the still image from my Youtube video. You wouldn’t want that to be at the top of the page, too ugly. Also, the image at the top right of my page isn’t showing, but the buttons are. They’re just linked images, not sure why the difference. I think the main take away is that if your running Google Adwords (and you should be, more on that soon!) you should check your preview and optimize your landing page so that it is attractive and compels the searcher to click on your ad. The SEO Sharks are After Your Money! Do you need SEO (search engine optimization) help with your business web site? If you’re like most business owners the answer is yes! You see, most sites have been built by a web designer whose primary goal was to build a site that you thought looked nice, a sort of art show you might say. The problem is that the vast majority of web designers out there don’t have a clue how to build a site with the proper SEO to get the free traffic flowing from Google search results. So why not go for one of those many offers you receive almost weekly to have an “SEO Expert” do their magic and get you on page one of the SERP’s? They make a lot of nice promises, and they work pretty cheap too. Unfortunately, the vast majority of them are fly by nights who just got turned on the the idea of selling their services to help local businesses with their sites. Many of the things they advertise doing for your SEO will actually hurt your rankings, especially if you’ve had your site online for a while. My suggestion is simple. When you’re ready for some real SEO work, hire someone local so you can meet face to face with them. Then ask them for references of other business owners that you can talk to. When you talk to the business owners, ask them how much improvement they saw from the work done and how much traffic their site gets. If they can’t answer these questions, don’t hire the person who did the work! SEO is not cheap, but done correctly it will bring and endless flow of free traffic to your site. If your site is designed right, you’ll see more sales and leads. That is the only bottom line that maters, skip the art shows. For more ideas on where to start with SEO for your web site see my page on SEO Packages here! Google – Sometimes They Just Make You Say Huh?? You can’t always believe what Google tells ya! Notice the warning that two of my bids are below the estimate to get my ads to appear on the first page of the SERPS? Now look at the Avg. Pos. for those same keyword phrases, 2.1 & 1.9. Last time I checked position 2 was still on page one, lol. just remember that all the data Google gives you is average date, not really specific to your account. As we work more and more with business owners in the Albuquerque area, getting them listed in Google’s Local Business Center, it’s always surprising to see how many established businesses do not have a web site! After several years of building websites for clients, I believe we understand the challenges that business owners face when trying to establish an internet presence for the first time. There are so many technical issues involved that are very confusing for people who don’t spend a lot of time with the internet. Keywords, back links, blogs, the list goes on and on. We are happy to tell you that we have a very simple solution for the problem! We’ve created a local business starter package for you that will get you up and running on the internet, and more importantly, get you into the new phone book, Google Places. This is a great way to begin your internet marketing presence for your business. It is designed to be easy to maintain and add to in the future. Just give us a call or drop an email, we’ll be happy to provide you with more information. Just a quick post here for all the folks who have downloaded the free guide to creating a Google Local Business Center (LBC) listing. First off, if you haven’t noticed, Google has changed the name and or merged with Google Places. No big deal here. What I really wanted to talk about was setting up Google Analytics to track traffic from your Local Business Center listing. While this is covered in the free guide, it is by far the most technically challenging part of the process. It took me a few tries to get it working. So if you have any questions about that part of the effort just drop me a line and I’ll do my best to help you out. On a side note, I discovered something very interesting after I figured out the tracking issue. On one site in particular, I saw a 100% increase to site traffic after setting up the LBC listing. I thought wow, all that traffic coming through maps? The answer was no! What actually happened is that my traffic from Yahoo and Bing took a huge jump. It appears that the other search engines are scraping content from Google Maps listings and ranking it in their engines. Just a little added benefit for your work!